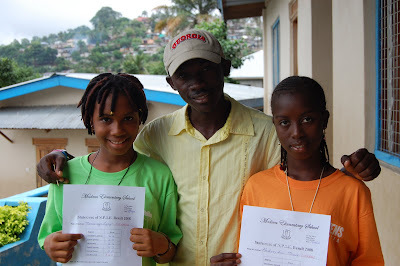 The final results from Lucy & Ann Marie's Elementary School are in and the girls proudly display them with their father, James and with their teacher in the above pictures. The girls now go onto High School. The girls have worked very hard and are very bright. We are all so very proud of them! 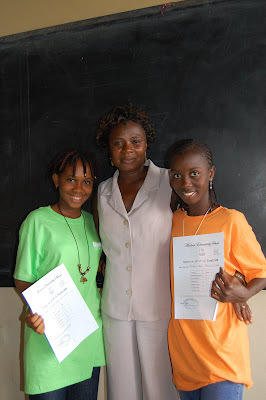 I just returned from Lucy and Ann Marie's school to pick up their results. They did extremely well with Lucy scoring an aggregate of 340 and Ann Marie 339. 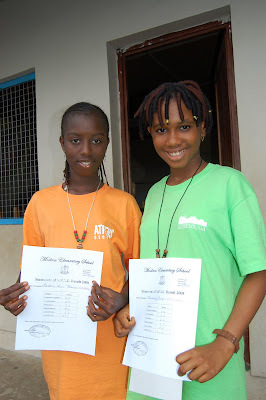 Any Marie took second in Mathematics in the entire school with a score of 88% and then Lucy took first in English Language with a score of 97%. The kid with the best result scored and Aggregate of 360. The best result in the whole country is 370. So you see how well the girls worked. Here are few pictures of them with. We are all so very very happy today. I make the next school move next week. Thanks to all those who have helped contribute to educate these beautiful girls. Love from all of us at St. Laurence house. I hope we can successfully pay for their next semester's tuition soon.